sequence. These numbers were derived from the prime trade involved in the construction. The 10,000 series indicates the Builders. A brief description appears next, followed, when appropriate, by the code "N" for the North Temperate Zone or "T" for the Tropical Zone. Only assemblies required for arctic operation are designated code "N." Other facilities or assemblies are designed for use in both North and South Temperate Zones and Tropical Zones. The quantity given is used as a multiplier, indicating the number of assemblies to be ordered. Weight and cubic feet are measured in normal terms for export packing. Weight, cubic feet, and dollar value reflect totals for each line. Construction estimates are computed in the same manner as components except for the addition of the primary facility capacity and the secondary capacity, as described in the NAVFAC P-72. This is used, for example, in the 700 series of facilities where the primary capacity is expressed in personnel and the secondary, in square feet. 1. Construction standards (CONST STD), taken from Joint Chiefs of Staff (JCS), publication 3, are grouped into two classifications: initial and temporary. Initial (INIT) is a duration requirement of less than 6 months. Temporary (TEMP) is a duration requirement of 6 to 60 months. 2. Days of construction duration (LAPSED DAYS) are based on job requirements, optimum construction crew size, and full-material availability. 3. Often the land requirements (LAND ACRES), based on the assumed plot plan, will not be followed exactly because of terrain or existing buildings. The idealized plot plan was developed to design supporting utility systems. The information contained in the utility facilities has been increased to allow for variation in terrain. 4. The connected electrical load (POWER kVA) has been computed based on knowledge of ABIOL or TOA contents. A load diversity factor has been applied to compute the kVA demand. 5. Water and sewer (GPD) are based on ABIOL or TOA contents and the utility systems designed to this criteria. 6. Fuel usage (FUEL GAL) is computed on 30-day requirements for installed engine-driven or fuel-fired equipment only. No allowance for automotive, construction, weight handling, and other jobsite support equipment fuel is included. Fuel is not provided when facilities or assemblies are shipped. NAVSUP provides fuel as a contribution when whole components are shipped. 7. The skill requirements (SKILLS MAN- HOURS) are designated by Seabee (OF- 13) ratings and are expressed in man-hours, as computed for each facility. The recoverability code is a broad indication of the relocatability or recoverability. 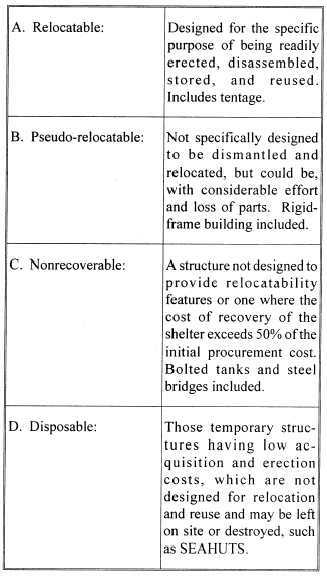 The code "A" indicates total recoverability, and "D" indicates a disposable facility. More details are found in table 9-2, Recoverability Code.